Why Bunn home coffee maker is good? 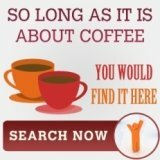 Bunn home coffee maker is low in price but deliver high standard coffee! Bunn home coffee maker is synonymous with Automatic drip coffee maker. It is like folks equating dispatch with Fedex -ever heard the statement "please fedex it for me?". So, one cannot talk about the former without touching on the latter. Drip or filter coffee maker is a simple set up with a paper filter placed in a plastic, glass or ceramic holder. And this filter would sits just on top of a glass carafe or coffee pot. To brew coffee, finely ground coffee is pour inside the filter. 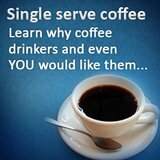 Hot water is then poured in, and the freshly brewed coffee would drip into the coffee pot or any other container below. The ground remains in the filter and is thrown away after use. For the electric version like bunn home coffee maker GR10, put the ground coffee in the filter paper liner inside the machine's round filter. The hot water is heated automatically and drip through the coffee bed, with coffee trickling into the coffee pot that sits on the machine's warming plate. 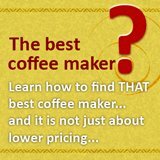 So much for how a drip coffee maker works, which one would best suit your needs? It is always a trial and error learning curve, nobody knows which model or brand suits them till they tried a few -there a few blessed folks that like the first one they purchased though! 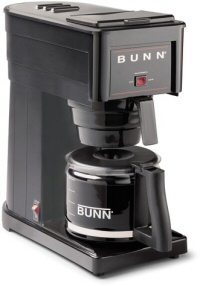 A good one to start would definitely be bunn home coffee maker. They are well known for its coffee maker, particularly the drip. Other than superb customer service (most model comes with 3 years warranty), it is their experience in making these machines -they have over 50 years experience in doing coffee makers! And Bunn GR10 would be the choice, my at least. It is the least expensive in Bunn entire stable of coffee makers, but its performance and quality matches the more expensive models. It is heavy duty, able to brew up to 10 cups in 3-4 minutes. And as it uses a water reservoir to keep the hot water on standby, it is always ready to brew coffee. You see, this Bunn home coffee maker store approximately 10 cups of water when you start the whole machine, and after 15 minutes when the water is heated up, it is a 'hot-water-on-demand' machine. Every time a pot of coffee is to be brew, just add in 10 cups of cold water, this would displaced the hot water inside, allowing the latter to soak and drip a fresh pot of cuppa! It might be a drawback for some but to me, the simplicity of this GR10 is appealing. 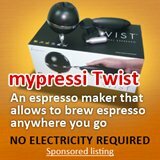 No timer, no flashing buttons or beeping sound, all in -this home coffee makers has only 2 buttons. A main switch located on the side to power the machine and a switch in front to power the heating plate for the coffee pot. Bunn website boast of numerous other features, but the one other feature which I find is necessary is the specially designed spray head. This spray head allows the hot water to saturate all of the ground, it is this that enable this bunn home coffee maker to achieve the optimum flavor and aroma for the coffee brewed. Although it sounds like this is the best coffee makers, to me, it is a matter of preference and taste profile. And personally, the bunn home coffee maker is good , simply because it brews the coffee that suits my palate.